The smallest member of the macaw family, the Hahn’s macaw has become rather popular pet birds owing to the entertainment quotient they bring to the fore. 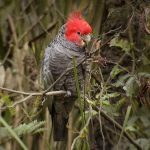 Ideal for first-time bird owners, one may never wish to graduate to another bird because of the Hahn’s’ endearing ways. They are slightly larger than a cockatiel and marginally smaller than a conure. 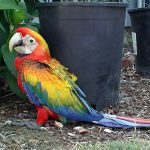 The entertaining and comical characteristics of the Hahn’s macaw parrot, complimented by its small size which entails easy maintenance have made this bird quite a popular pet. 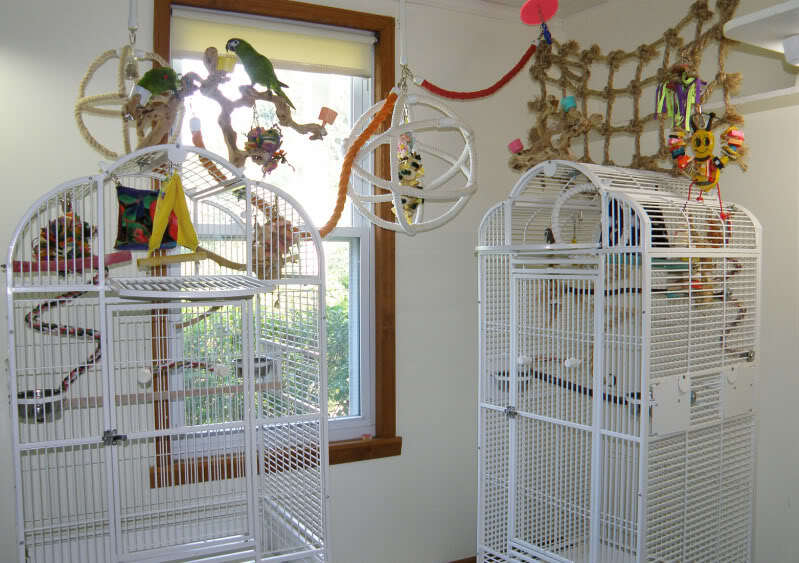 They are quite loud, though, so they might not be the best choice for adoption if you’re living in an apartment with neighbor’s next door. 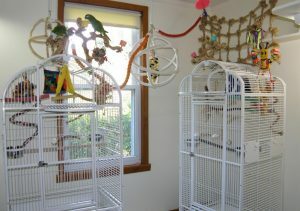 A sizeable cage with dimensions of at least 2.5’x3’ should be provided for the bird to live in. 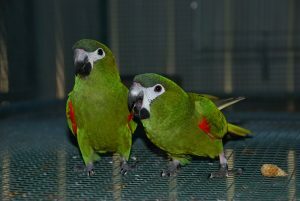 They do however like to outside of the cage for at least 2-3 hours a day, interacting with the owner. If your budget permits, then it might be a good idea to go for a playpen, play gym or a sturdy parrot perch. 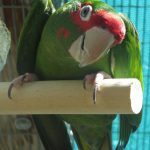 They like to chew, so an adequate number of wooden chewable toys and branches must be provided to keep boredom at bay and enhance enrichment. As long as the temperature does not get below 37.4°F (3°C) the bird should be fine, if the temperature does plummet below that, arrange for a heater. 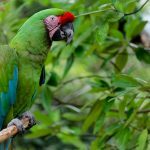 The Hahn’s macaw has on it one of the best temperaments that you can hope or, even by macaw standards. 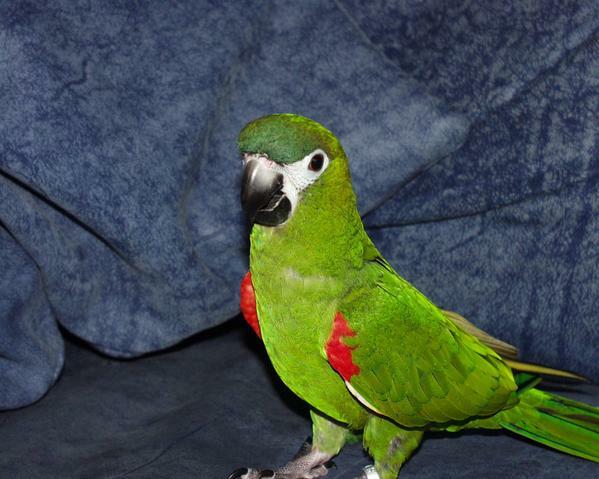 It is very social and ideal as a pet for a family. Their intelligence for and inquisitiveness to learn is something to behold. They like to be handled by their owners, but may sometimes develop bonds with one member of the family and get irritated to the point of being nippy at the sight of another, but this is rare. To avoid this, make sure your bird is well-socialized with plenty of people. 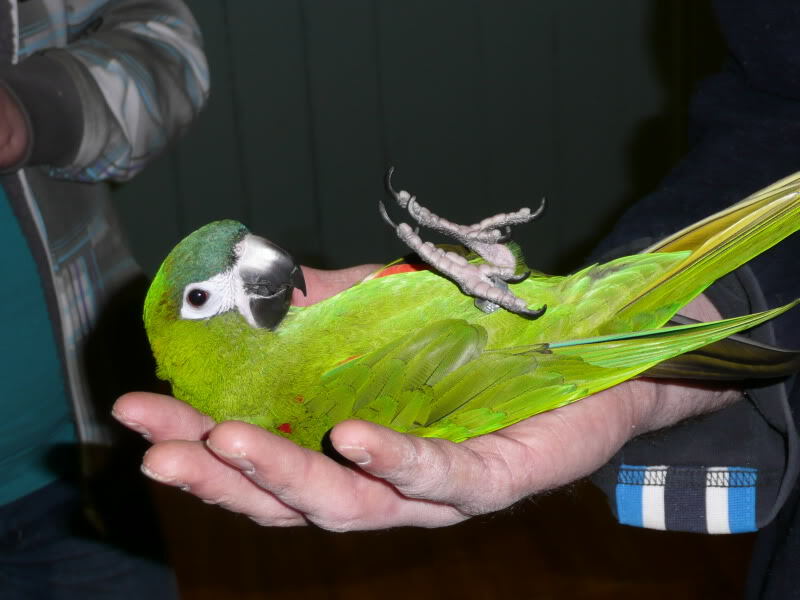 Your mood, at most times, will be mirrored by your bird. 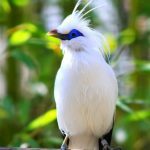 Your happiness will make the bird’s mood happier, and vice versa. 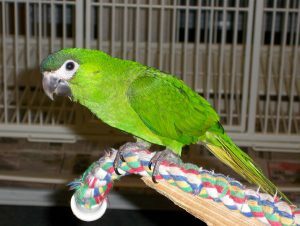 Your bird will learn to speak and do tricks rather well as long as it is trained as such from a relatively young age. A diet of high-quality seed and pellet mix should be given to your bird on a regular basis. Fresh fruits and vegetables must be given daily. 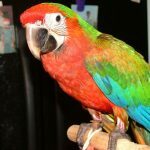 Your Hahn’s macaw must regularly be bathed to keep the brightness of the plumage at an optimal and maintain feather health. 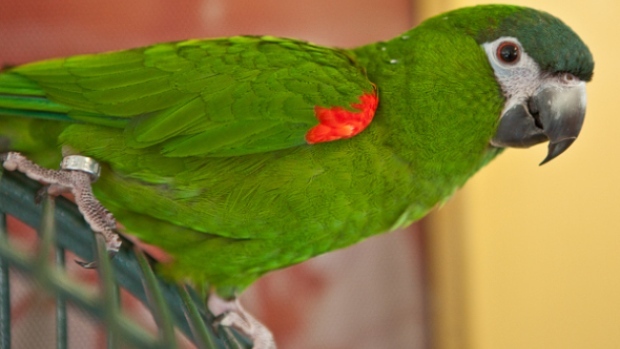 You may use a bird mist or a shower sprayer for this purpose and the water should be lukewarm. 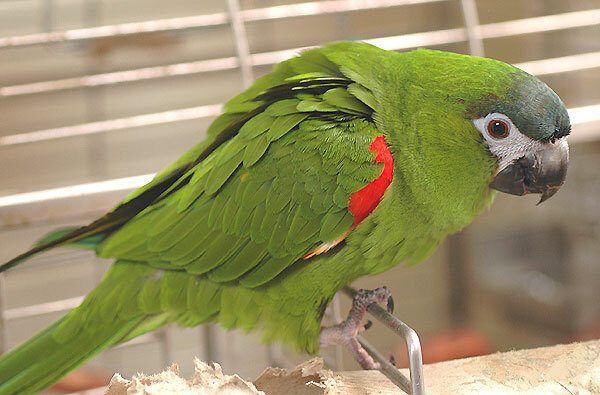 Wings should be cut just enough so that that bird can glide onto the floor. 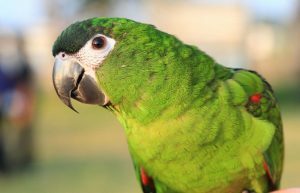 Beaks also need to be trimmed if they become deformed or overgrown. 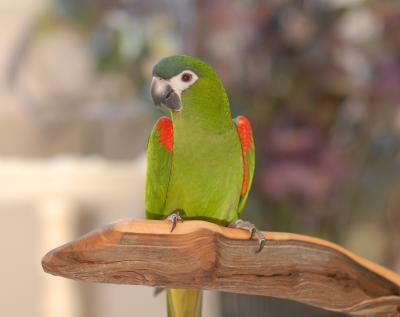 Various types of perches may be available at pet stores which will help in keeping the nails trimmed. 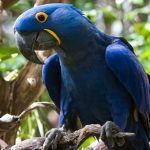 Hahn’s macaws can be bought for $800-$1,200. Due to the similarities in appearance to the conure family, the Hahn’s macaw have sometimes been cross-bred with blue-crowned and sun conures to produce macaw-conure hybrids. 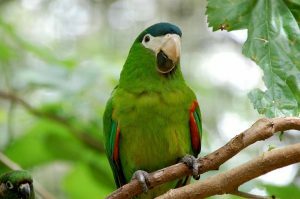 They are smallest of the three subspecies of the red-shouldered macaw. 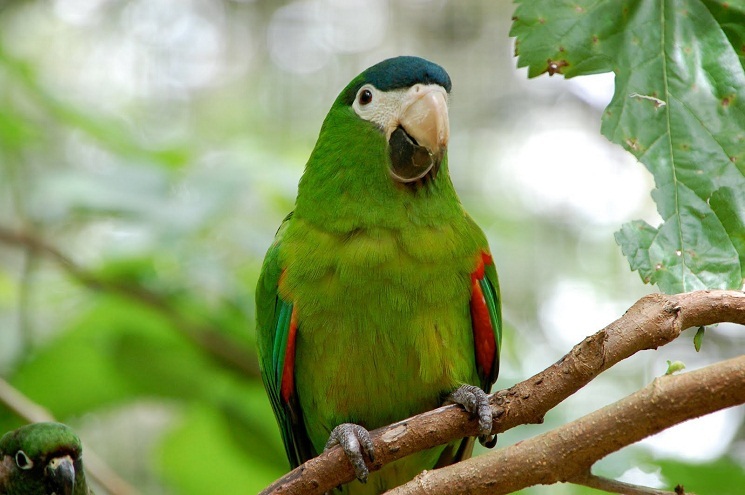 The other two members are the noble macaw ( n. cumanensis) and the long-winged macaw (D. n. longipennis). 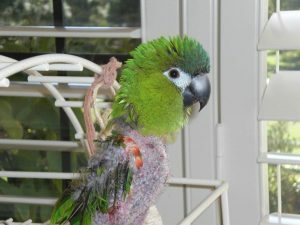 The difference between the Hahn’s and the other two is the fact that while the former’s beak is black, the other two’s beaks are horn-colored.